Get 13 grams of protein to go in this 5-minute, calcium-rich burrito! Place tortilla in small microwaveable bowl; top with 2% Milk Singles. Add egg; beat gently with fork. Microwave on HIGH 1 min. or just until egg is set. Transfer tortilla to small sheet of foil; top with salsa. Fold tortilla over egg, then wrap in foil. 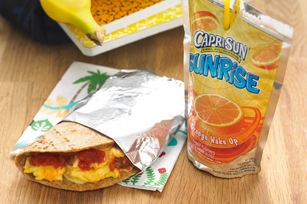 Older kids can prepare this cheesy breakfast without any assistance, which makes mom's morning a little less stressful.